Analysis of Kepler data has yielded the smallest known mass for an exoplanet orbiting a normal star. Its mass and size are similar to those of Mars, setting a benchmark for the properties of exoplanets smaller than Earth. With a mass one-tenth that of Earth’s, half its diameter, and a residual gleam of long-lost habitability, Mars has an outsized hold on our imagination. Jontof-Hutter et al. (1) report the discovery of Kepler-138 b — an alien world that has a mass, a radius and perhaps an overall composition very similar to those of Mars. In contrast to warm Earth or cold Mars, however, this planet is baking hot because of its proximity to its host star. The current exoplanet census is dominated by planets a few times the size of Earth and on orbits close to their stars, and so our Solar System — with its four small inner planets — seems somewhat marginalized. The detection of such a small exoplanet in a tight orbit could help to clarify how we fit into the big picture. NASA’s successful Kepler space observatory made the observations that enabled the detection of this low-mass world. Between 2009 and 2013, Kepler monitored more than 150,000 stars in a patch of sky just above the mid-plane of the Milky Way, and recorded the periodic diminutions in brightness that occur when planets with appropriately aligned orbits transit (pass in front of) their parent stars(2). At the last count, more than 4,600 candidate planets had been identified in the data returned by the Kepler mission(3). Although the bulk of these prospective worlds have radii 2–4 times that of Earth’s and display a bewildering range of compositions, more than 500 candidates have radii smaller than Earth’s. The race is on to elevate these candidates to confirmed planetary detections(4). Observations of repeating dips in the brightness of a host star, each dip having identical depth and duration, might seem to constitute fail-safe evidence of an orbiting planet. There is, however, a host of potential false alarms that can compromise a detection, notably the possibility that a background, eclipsing binary star registers on the same detector pixel as the candidate planet’s host star, so that periodic eclipses in the distant system can mimic planetary transits of the target star(5). So far, more than 1,000 of Kepler’s planets have been vetted and confirmed, but the process of follow-up evaluation (especially for the low-mass worlds) will continue for decades. Transit detections provide an estimate of a planet’s size, but they give no information about its mass. 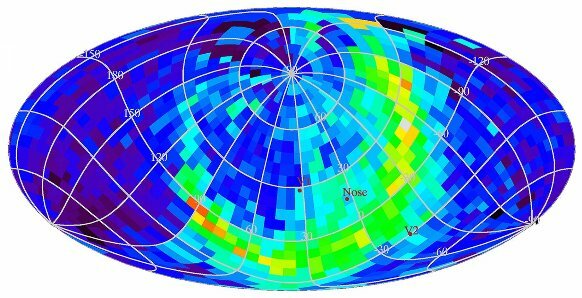 For massive transiting planets, masses can be estimated by Doppler spectroscopic monitoring of the host star’s velocity variations along the line of sight of the observation. This option, however, is unavailable for a planet such as Kepler-138 b, which is too small to induce detectable wobbles in the host star’s motion(6). During the nineteenth century, Mars presented a similar challenge to astronomers who were trying to estimate its mass. In 1877, the discovery of the planet’s tiny satellites (Phobos and Deimos) allowed the mass of Mars to be determined accurately and directly. Earlier estimates, however, beginning with the efforts of Jean Baptiste Joseph Delambre in 1806, were obtained by carefully accounting for Mars’s gravitational influence on other planets in the Solar System, and calculating their effects on the precisely measurable daily location of the Sun. By 1850, refinements of this technique had narrowed the Martian mass estimate to within 20% of its true value(7). Jontof-Hutter and colleagues have drawn from the same time-tested notebook of dynamical astronomy to deduce the mass of Kepler-138 b. The planet is part of a system (Fig. 1) that contains two additional transiting planets, Kepler-138 c and Kepler-138 d, which have periods of 13.8 and 23.1 days, respectively, and radii slightly larger than that of Earth. The inner planet pairing between 138 b and 138 c has an orbital-period ratio of nearly 4:3, whereas the outer pairing between 138 c and 138 d has a ratio near 5:3. Because the period ratios are almost exact ratios of integers, this enables the gravitational distortions of the orbit of one planet by the other planets to gradually ebb and flow, producing observable departures from expected strict regularity in the transit times. Measurements of the planets’ transit timing variations constitute a nonlinear, computationally intensive inverse problem, the solution of which has allowed the authors to deduce the masses of all three planets. The graphic depicts the orbital architecture of an exoplanet system discovered by the Kepler space observatory. Jontof-Hutter et al. 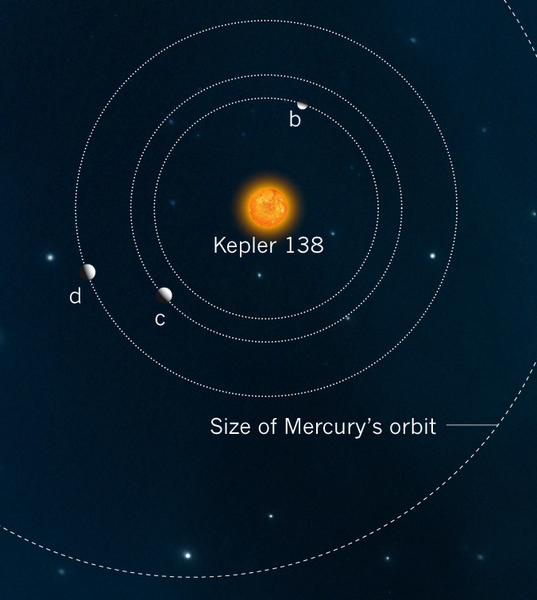 (1) report the sizes and masses of planets Kepler-138 b, Kepler-138 c and Kepler-138 d. Kepler-138 b, on a 10.3-day orbit, has the smallest measured mass of any transiting exoplanet — it has a size and mass similar to those of Mars. Kepler-138 c and Kepler-138 d are slightly larger than Earth and have orbital periods of 13.8 days and 23.1 days, respectively. The orbits are drawn relative to the size of Mercury’s 88-day orbit. The radii of known exoplanets generally display surprisingly little correlation with their masses, especially for planets that are somewhat more massive than Earth. Jontof-Hutter et al. report a mass of around 0.07 Earth masses for Kepler-138 b, imbuing it with a bulk density of about 3 grams per cubic centimetre — consistent with a purely rocky composition roughly akin to that of Mars. The planet’s mass is similar to, but somewhat less than that of Mars (by contrast, its surface temperature is much higher). Whether we are probing an outlier world, or whether the authors’ discovery points to an important trend among low-mass planets — whereby smaller radii exhibit strong positive correlation with smaller masses — is as yet unclear. The derivation of dynamical properties from transit measurements requires timing data with split-second precision, and so the mass and density of Kepler-138 b both have large uncertainties, of a factor of about two. The prime drivers of the uncertainty are the relatively low number of planetary transits that have been observed and the timing precision. These can be improved both with longer observation campaigns and, eventually, with space missions capable of observing at intervals shorter than Kepler’s 1-minute limit. The European Space Agency’s PLATO (Planetary Transits and Oscillations of Stars) mission planned for the mid-2020s, for example, will be able to monitor the brightest transit-bearing stars at a temporal resolution of 2.5 seconds. Kepler-138 b orbits a red dwarf star, the mass, radius, chemical composition and space motion of which are close to those of the ‘average’ star in the Milky Way. The Kepler-138 planetary system also seems to be unexceptional when placed in its galactic context. The Kepler mission has demonstrated that it is extremely common for stars to harbour multiple planets with orbital periods of less than 100 days and masses of lower than 20 Earth masses. By contrast, the reaches of the Solar System interior to Mercury, which has an 88-day orbit, are completely empty. It is imperative to improve our understanding of how our system’s architecture and evolution fit into the overall census — the authors’ study is a step towards that goal. A pressing question is whether planets such as those orbiting Kepler-138 formed in situ, or whether they accumulated in colder, distant regions of the protoplanetary disk before migrating inwards. Short-period, low-mass planets that cannot retain hydrogen atmospheres, and the densities of which are similar to mixtures of rock and ice, present evidence in favour of inward migration from cold regions. This is because planets with an icy bulk cannot have formed close to their star. Additional, increasingly accurate mass and radius measurements, both for Kepler-138 b and for other small exoplanets, will be facilitated soon by NASA’s TESS (Transiting Exoplanet Survey Satellite) mission(8), scheduled for 2017, and will help to provide an answer. (1) Jontof-Hutter, D., Rowe, J. F., Lissauer, J. J., Fabrycky, D. C. & Ford, E. B. Nature 522, 321–323 (2015). (2) Borucki, W. et al. Science 327, 977–980 (2010). (4) Marcy, G. W. et al. Astrophys. J. Suppl. Ser. 210, 20 (2014). (5) Gautier, T. N. III et al. Preprint at arXiv (2010). (6) Fischer, D. A. et al. in Protostars and Planets VI (eds Beuther, H. et al.) 715–737 (Univ. Arizona Press, 2014). (7) Grant, R. History of Physical Astronomy (Bohn, 1852). (8) Ricker, G. et al. J. Astron. Telesc. Instrum. Syst. 1, 014003 (2014). 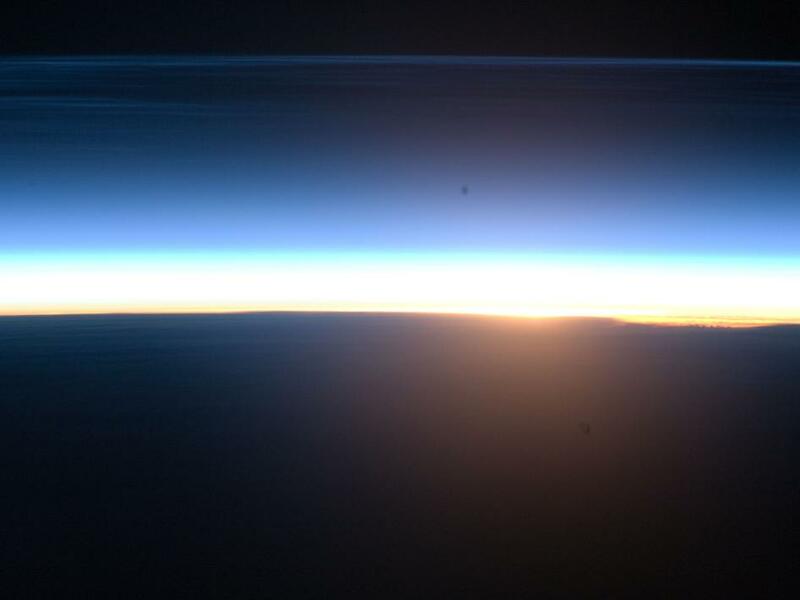 The Expedition 24 crew on the International Space Station photographed this image of polar mesospheric clouds illuminated by an orbital sunrise. Polar mesospheric, or noctilucent ("night shining"), clouds usually are seen at twilight, following the setting of the sun below the horizon and darkening of Earth's surface. Occasionally the station's orbital track becomes nearly parallel to Earth's day/night terminator for a time, allowing the clouds to be visible to the crew at times other than the usual twilight because of the station's altitude. This photograph shows polar mesospheric clouds illuminated by the rising, rather than setting, sun at center right. Low clouds on the horizon appear yellow and orange, while higher clouds and aerosols are illuminated a brilliant white. Polar mesospheric clouds appear as light blue ribbons extending across the top of the image. The station was located over the Greek island of Kos in the Aegean Sea (near the southwestern coastline of Turkey) when the image was taken at approximately midnight local time. The orbital complex was tracking northeastward, nearly parallel to the terminator, making it possible to observe an apparent "sunrise" located almost due north. A similar unusual alignment of the ISS orbit track, terminator position and seasonal position of Earth's orbit around the sun allowed for this striking imagery of over the Southern Hemisphere. On its way to a 2014 rendezvous with comet 67P/Churyumov-Gerasimenko, the European Space Agency's Rosetta spacecraft, with NASA instruments aboard, flew past asteroid Lutetia on Saturday, July 10. The instruments aboard Rosetta recorded the first close-up image of the biggest asteroid so far visited by a spacecraft. Rosetta made measurements to derive the mass of the object, understand the properties of the asteroid's surface crust, record the solar wind in the vicinity and look for evidence of an atmosphere. The spacecraft passed the asteroid at a minimum distance of 3,160 kilometers (1,950 miles) and at a velocity of 15 kilometers (9 miles) per second, completing the flyby in just a minute. But the cameras and other instruments had been working for hours and in some cases days beforehand, and will continue afterwards. 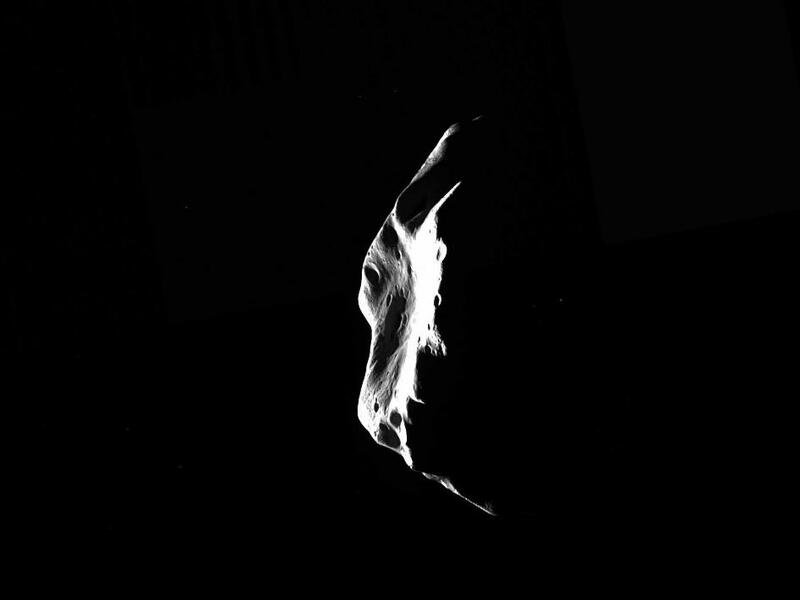 Shortly after closest approach, Rosetta began transmitting data to Earth for processing. Lutetia has been a mystery for many years. Ground telescopes have shown that it presents confusing characteristics. In some respects it resembles a ‘C-type’ asteroid, a primitive body left over from the formation of the solar system. In others, it looks like an ‘M-type’. These have been associated with iron meteorites, are usually reddish and thought to be fragments of the cores of much larger objects. Un piccolo post con immagini, per continuare a provare. Per dettagli, andare su Science Backstage.